Marketers’ and brands’ main objectives with social media is to build strong relationships with their target audience, while also building trust, credibility, and reputation. All of these things ultimately lead to increased sales. But to do so, brands need to share high-quality posts, that are relevant to their niche – consistently. When using social media for marketing, there are a lot of things to think about. For example how you should engage with your audience. There are also other things you need to know about, for example, things that you shouldn’t do – more specifically avoid, for a successful social media marketing campaign. These can be common, small mistakes that can be very harmful to your overall results on social media. Doing all of these things are not always as easy as they sound, as you can imagine. First off, it’s important that you are aware of all the dangers and things you shouldn’t do on social media, but it’s also important to know about all the things you should do to reach your full potential in social media marketing. To help you do just that, we have compiled an article including the key tips to creating killer posts on social media, and also the Top 5 Do’s and Don’ts For a Successful Social Media Marketing. The time you post and how often you post will play a huge role in your overall marketing results on social media. By posting regularly, you make sure that your brand is on top of your audiences’ mind and never forgotten. Apart from posting regularly, you also want to make your post consistent. On social media, Consistency is key. This lets your audience know when they can expect a post from you and might visit the platform just to see your post. Whatever you do, post at least once a day. Of course, this depends on the platform you’re using, but the general rule is at least once a day. 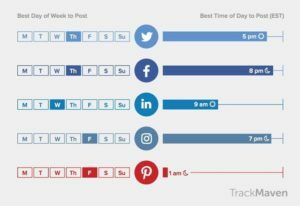 Apart from only using the broad term of “every day”, you should also measure specifically what time of the day generates the best results in the form of biggest reach and highest engagement. Of course, it’s difficult to say a which time is most suitable for you because it will depend on a bunch of factors, the main factor being the demographics of your followers. But here’s a compilation of some of the most popular platforms, followed by the best day to post and the best time to post. Generally speaking of course, because it will depend from case to case. The best thing you can do is to experiment on your own to see when the best times to post is, for you. There’s a big difference between what you think your audience will enjoy and what they actually do enjoy. A mistake that many make is assuming what kind of content their audience will like, based on what they like. While it’s a good start, the best way is to test. Instead, of assuming, why not test different types of content and see what resonates best with your followers. In this way, you’ll get the answers black on white – without any assumptions included. Trying out what kind of content your audience like is simple. Simply post one type of content, then make some slight changes (or whatever you want to do), and then post it an hour or two later. Now, see which one performed better. In a quick and simple way, you’ll be able to see which performed better. Do have in mind though that the engagement may vary because of the time you post the content as we talked about above, so it’s important that you have added these varying factors into the equation as well. Consistency is key for building a following, but engagement is key if you want to retain your followers and build lifelong relationships. If you’re active on social media already, you’re probably receiving some comments on your posts. Are you responding to them or are you completely ignoring the comments? If you’re doing the latter, you must change that immediately. Even if someone just write “nice” or leave a smiley on your post, you must answer it. This shows them that you value your audience, and you’ll slowly build the trust they have to you. In addition, you’ll also dramatically increase the chances of them continuing to follow and engage with your brand on social media. Let’s say someone leaves a comment asking your brand a question. If no one responds, do you think they will write to you next time they have a question? Maybe they will go to your competitors and ask the question instead. You shouldn’t only respond to compliments and regular questions either. You should respond to every single comment. Except possibly if it’s a bot comment, but that’s the only exception. Even if it’s a complaint, you should respond. Because if you don’t, you’ll only make them angrier, and on top of that, the comment is open for the world to see, which makes it even more important for you to show how good your customer service is. If you don’t respond, everyone will see it and it might prevent them from buying from you because they see how terrible your customer service is. Read Why you should respond to every customer complaint on social media to learn more about this matter. The most important thing to remember is that an angry complaint shouldn’t be seen as the end of the world. Instead, it should be seen as an opportunity for you to convert them back to loyal followers. If you have several social media platforms, cross-promoting is a great way to build awareness around your existence on the different platforms, and ultimately gain more followers. For example, make a Tweet referring back to a post you just done on Facebook, or, even better, arrange a contest on one platform and then market it using all of your other platforms. Having something to tempt your audience with is a great way to get them to visit you on other social medias. Don’t share the same content on all your social media platforms. Some say that you should, but that’s completely wrong. 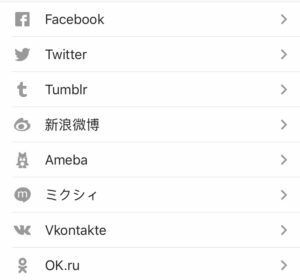 A lot of social media platforms let you automatically post to your other platforms when making a post inside the app by logging in to your other account through it. This means that everything you need to do is post on one social media platform, and then the post will automatically be posted on the rest of them. Sounds very simple, and almost too good to be true. While it is true, it isn’t something that you should use. By posting the same content every single day on each of your platforms, there’s no point in following you on all of your platforms, right? Technically, you would only need to follow you only one platform to get access to the content you are sharing. In addition, all social media platforms are different and should be treated accordingly. If you want true success on them, every single platform should have an own content strategy. For example, Facebook is more text driven, while platforms like Snapchat, Pinterest and Instagram are almost completely based on visual content. On social media, quality is much more important than quantity, while sharing quality content regularly is the best of course. Creating killer content on social media can be a tough and time-consuming challenge and therefore, it’s important that you set reasonable goals when making your content strategy. Otherwise, you will end up posting content that you are not completely sure about just because you “have to” share content.